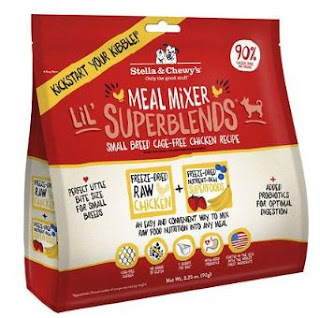 Kickstart your kibble with Stella & Chewy's Lil' SuperBlends Small Breed Cage-Free Chicken Recipe Meal Mixers Freeze-Dried Raw Dog Food Topper. Delivering a boost of superfoods with blueberries, strawberries, and bananas, it’s an easy way to pack your small dog’s diet with nutrients, probiotics, and antioxidants. Based on the philosophy that pets thrive on the same diet they would eat in the wild, this recipe gives your dog what he naturally craves, and is made from 95% cage-free chicken, organs, and bone, plus 100% organic fruits and vegetables. Simply scoop, mix in with your pet’s kibble, and watch him come running! The bite-sized morsels are perfect for small breeds. Easy way to add real raw nutrition and superfoods to a small dog’s diet with bite-sized morsels. Each bag comes with a scoop! Kiah was very curious about this Meal Mixer! In fact, she became very impatient. She was so excited that she didn't want this food to just be added to the top of her other food she wanted all of it and I'm pretty sure she would have eaten the entire bag in one sitting if I let her. I'm glad I didn't let her indulge in all of it. I was able to use it as bribes for a few days. We have been hit with some very cold weather in the Midwest and I didn't have any other treats so every time she went outside to go potty she got some of this! It worked for us because no one wanted to go out with windchills reaching -50!! So now that she treated this as a treat I am hoping to find a bigger bag on chewy.com. I hope your furry friend would also enjoy the Chewy Meal Mixers!